Austin Rivers caught fire in the second half and, with some help from Lou Williams, shot the short-handed Los Angeles Clippers past the Houston Rockets 128-118 on Friday night at Toyota Center. Rivers scored 30 of his team-high 36 points on 10-of-18 shooting in the second half, drilling 5 of 10 3-pointers down the stretch to keep the injury-riddled Rockets (25-6) at bay. Williams, traded by Houston in the offseason as part of the blockbuster Chris Paul acquisition, scored 32 points. Rivers and Williams combined to shoot 13 for 24 from behind the arc to offset another breathtaking performance from Rockets guard James Harden, who posted his second consecutive 51-point outing. Harden finished 15 of 28 from the floor and 15 of 16 from the free-throw line while adding eight assists. Eric Gordon chipped in 28 points for Houston, which closed a season-long seven-game homestand with consecutive losses to the Los Angeles teams. Golden State regained the top spot in the Western Conference, rallying from a fourth-quarter deficit to win its 11th straight game. Kevin Durant had 33 points (12 on free throws) to lead the Warriors, who have beaten the Lakers the last 10 times they've met in Oakland. Rookie Jordan Bell (20 points and 10 rebounds) and Draymond Green (13 points and 11 rebounds), returning from a four-game absence, complemented Durant with double-doubles for the Warriors. 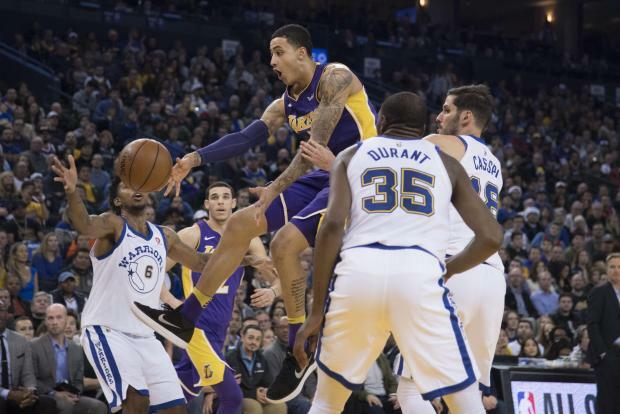 Rookies Kyle Kuzma (27 points and 14 rebounds) and Lonzo Ball (24 points) paced the Lakers, who had taken the Warriors to overtime in their two previous meetings this season. Julius Randle added 21 points for the Lakers (11-19), who were coming off a 122-116 win at Houston. Russell Westbrook hit the winning 3-pointer with 1.4 seconds left to lift Oklahoma City past Atlanta. The NBA's reigning MVP, Westbrook finished with 30 points and 15 rebounds. Carmelo Anthony finished with 24 points and Paul George scored 17 for the Thunder. Atlanta's Marco Belinelli was a big reason for keeping the game close as he scored 27 points on 10-of-18 shooting. Ersan Llyasova added 22 points and Malcolm Delaney had 20. Giannis Antetokounmpo and Khris Middleton combined for 14 points in the fourth quarter as Milwaukee closed the game with an 9-0 run to beat Charlotte Hornets. Middleton led Milwaukee with 28 points and Antetokounmpo added 26. Eric Bledsoe struggled from distance, going 1 of 6, but hit 7 of 10 from the line to finish with 24 points while adding 10 assists, five rebounds and three blocked shots. Kemba Walker connected on four 3-pointers and finished with a game-high 32 points for the Hornets, who went 12 of 26 from beyond the arc and shot 44 percent (39 of 88) overall. Forward Rondae Hollis-Jefferson had 21 points, 11 rebounds and six assists, and swingman Caris LeVert had 17 points and six rebounds as six players scored in double figures to power Brooklyn's rout of Washington. The Nets snapped a four-game losing streak with its second home win over Washington in 10 days. Spencer Dinwiddie had the hot hand out of the halftime break, scoring the Nets' first 11 points of the second half on the way to 15 in the third quarter. Forward Kelly Oubre had 13 points and guard John Wall added 10 points for the Wizards, who were held below 100 points for the fourth time in the last six games. DeMarcus Cousins had 26 points, 11 rebounds and six assists, leading New Orleans to an easy victory over Orlando. New Orleans guard Jrue Holiday scored 24 points for the Pelicans. All-Star forward Anthony Davis had 20 points and 11 rebounds. It was the first time in the last 13 games the Pelicans held a team under 100 points. Jonathon Simmons led the Magic with 22 points and eight rebounds. Nikola Vucevic had 21 points and eight rebounds. Tobias Harris led seven Detroit players in double figures with 24 points and the Pistons pulled out a victory over New York. Andre Drummond had 18 points and 15 rebounds for the Pistons. Reggie Bullock supplied 14 points, Stanley Johnson and Antony Tolliver tossed in 12 apiece and Reggie Jackson and Ish Smith added 10 apiece. Kristaps Porzingis led the Knicks with 29 points and nine rebounds. Enes Kanter contributed 22 points and 16 rebounds and Courtney Lee added 16 points for the Knicks. Wayne Ellington scored 28 points to lead Miami past Dallas. Ellington shot 10 of 16 from the field and hit a career-high eight 3-pointers, including four in the fourth quarter. Josh Richardson scored 24 points on 11-of-14 shooting and Tyler Johnson finished with 19 points for Miami. The roster-depleted Heat lost another starter to injury after starting guard Dion Waiters limped off the court with an apparent left ankle injury late in the first quarter and didn't return. Yogi Ferrell scored 23 points, and hit 9 of 13 3-pointers for Dallas. The Mavericks hit 17 3-pointers. Nikola Jokic scored 27 points and Wilson Chandler added a season-high 21 points and 11 rebounds as Denver drilled Portland. Gary Harris scored 17 points for the Nuggets, who snapped a two-game losing streak. Jokic, who made 12 of 21 field goal attempts, added eight rebounds and six assists. CJ McCollum scored 15 points and Shabazz Napier had 14 for the Trail Blazers, who were without leading scorer Damian Lillard. Portland has lost three straight overall and six in a row at home.